In the January issue of Sharpeners Report, Judy Brenner interviewed Randy Kinney and me on the new harmonic treatment we are using to strengthen metal for sharpening. We are very excited about the attention that this process is receiving. If you have any questions about our harmonic treatment or want to try the service for your own instruments, give me a call at 800-972-9223 or email me at dkind93@gmail.com. You can also visit my webpage dedicated to explaining the harmonic treatment in more detail: https://dk-industries.com/2017/02/05/harmonic-treatment-gets-micro-sharp-edge/. Did you know that there are microscopic fissures, gaps and cracks hidden in the surfaces of metallic tools and instruments? These cause the metal to underperform and wear at a faster rate. DRK Technologies has developed a process whereby “The MicroEdge” removes such defects, enhancing a tool’s performance and extending its lifespan by 300-500 percent, according to co-owners Randy Kinney, DRK Technologies, Knoxville, TN and Dean Koeneman, DK Industries, in Kentucky. This treatment penetrates all the way through the steel. The experiments have been going on for more than a year, and now are ready to market to other sharpeners and end users. Price points are still being established, but considering the process is said to triple the life of a blade edge, it has been suggested $65 for shears; $10 for dental instruments; and $12 for clipper blades. Machine tools vary, based on volume. “This metal treatment not only increases the lifespan of a device, but also, improves its maneuverability and cut. Cracks within an instrument allow it to flex and move. But once these gaps are closed, the tool will perform with finer precision,” Randy said. Typically, the outer layer of an instrument suffers the greatest amount of stress after heat-treatment. Each time an untreated tool is sharpened, its outer layer is removed, requiring the tool to be recoated after each regrinding. But The Micro Edge eliminates the need for coatings altogether, allowing for twice the number of regrinds. “Once an instrument undergoes The Micro Edge treatment, achieving the desired level of sharpness will require removing less material from the cutting edge,” Randy says. 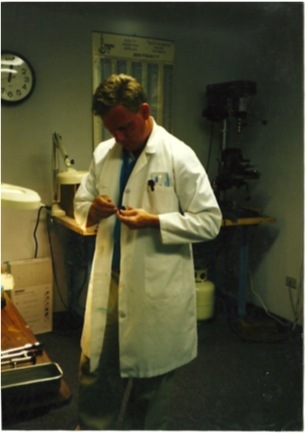 His other company, Knoxville Blade Sharpening & Bio Med Repairs, has tested the process on behalf of customers. “We’ve been giving tools to clients since May 2016, and the feedback has been very positive,” he said. Sharpeners Report sought out some opinions to see what end users thought. Here’s what was reported. The micro edge process is also applicable to clipper blades and machine tools, specifically any cutting tool such as end mills, drilling broaching, punch & dies, and some others that have abrasive wear. More information will be available during the Sharp Fest where DRK Technologies will have the Micro Edge exhibit. After 25 years of using heat to temper steel, I learned that heat only tempers the outer third of the steel. 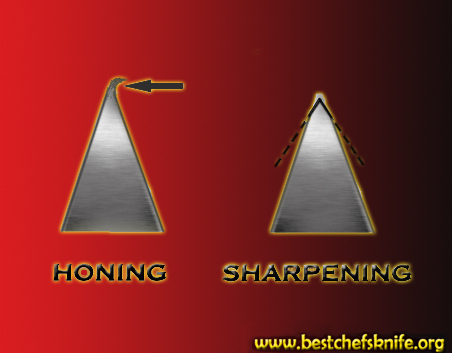 This is why the sharpening of an edge doesn’t last as long with each sharpening. Recently, I discovered a new way of tempering the steel all to its core, thus improving its edge by 300%. This method is the harmonic treatment and it is an innovative, patented metal treatment that uses sound waves to reach the steel’s core. The microscopic fissures, gaps and cracks hidden in the surface of the steel causes the steel to underperform and wear at a faster rate. This harmonic treatment removes such defects, enhancing a shears performance and extending its life span by that 300%. This steel treatment not only increases the life span of a shear; it also improves the cutting action by 2/3. Using more cutting surface means sharper and easier cutting and means a longer-lasting edges. The edge of before the harmonic treatment, magnified 100,000 times. You can see the jagged edge of the sharpened blade. The same edge after the harmonic treatment, magnified 100,000 times again. This edge is smooth and has a straight line. For more information about the harmonic treatment, please contact me by calling 800-972-9223 or by emailing dkind93@gmail.com. Honing is the process of smoothing metal after getting rid of the blemishes along the edge. 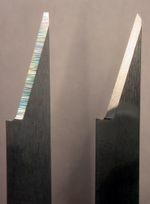 It is not a practice that is unique or specific to shear sharpening. Honing is a process that is as old as the hills (as they say) and is used in any type of finishing work. Honing is commonly used by machinists to shave off small amounts of metal to bring engine parts into the proper specifications. That way all the parts fit together when it’s time for assembly. Honing, when sharpening shears, does the exact same thing. The difference is when honing a pair of shears the amount of metal being removed is so very, very small that it’s often an overlooked process; but it is so very, very important. The actual sharpening of the shears is all about the skill of the sharpener in the honing of the shear blade. So what do you say we do some honing? The sharpening process is really a constant process of reducing the blemishes along the shear blade until there are none left. When it comes to getting the old edge off of a pair of shears it is necessary to use an abrasion that is going to get the damage off the shear without producing any significant heat. Once that is done, the next step is to get rid of the scratches caused by disk or wheel that was used to cut the damage off with. The disk or wheel that I use for honing will have a very small abrasion on it and I will gauge what kind of work that it does by the kind of pressure that I put on the shear blade and how fast I pull it across the surface.I always do this honing process in a very light repetitive manner because there is very little heat produced. Along with smoothing the metal, honing also produces a small burr along the leading edge of the shear blade. This burr is one that we can control now. It is burr is even all along the blade and we know that there is no damage below it to produce any dead spots. This is the time to polish the ride-line and stand the burr up and then hone the top part of the blade to bend the burr down. This is done repeatedly to get this “control burr” to break off and leave us will and clean sharp edge. Sometimes it can take some time to accomplish because of the differences in the type of steal being used in the shears. However, by repeating over and over and checking the progress the “control burr” is taken off and a nice clean, sharp edge is produced. If you watched the TODAY show February 22rd, you will know that there is a necessity to keep surgical instruments as clean as possible, and you will know that the necessity is not being met as often as it should; all instruments, once cleaned, should be sterile and ready to use 100% of the time. The Instrument Renewal System is a high-tech reconidition system that will permanently remove all the rust and strains from the surface of an instrument. Metallurgists, chemist, and metal manufactures from all over the country worked together to come up with a solution. DK Industries spent years putting this their knowledge to working, creating the perfect reconiditioning system. It is both mobile and safe; DK has since spent the last 25 years using this, the most effective system.